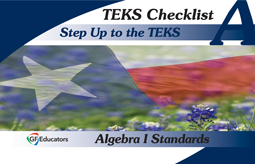 The TEKS Checklists combine an in-depth understanding of the TEKS along with vertically aligned expectations from adjoining grade levels. This tool was developed by teachers for teachers as a must-have road map! Wondering what to do for Rtl? The vertical alignment identifies the concepts that were taught in the previous grade to determine a place to start and shows how concepts are building blocks for later grades.